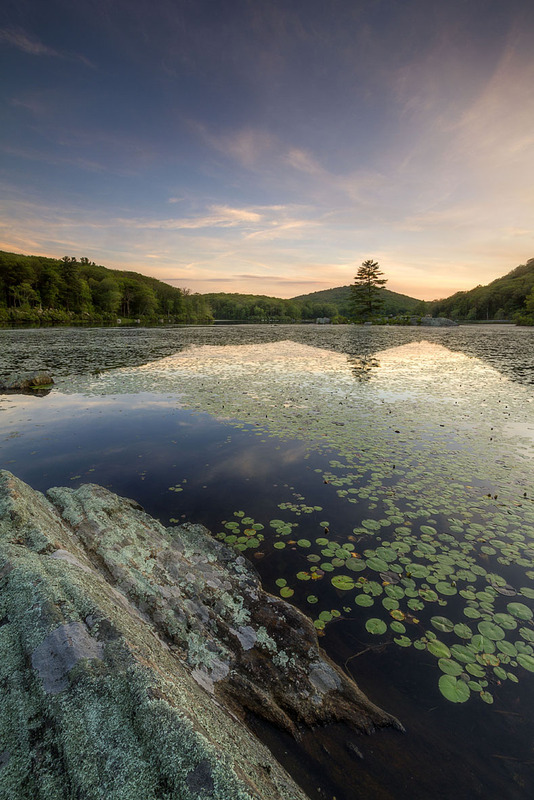 This image of Little Long Pond was not my intended destination to shoot. It’s always funny I guess how things work out. My intention was shoot from an outcrop over looking Lake Skannatati. The day seemed to be shaping up well.The skies were looking great all day and I was anxious to return to outcrop that I’ve shot at before. I arrived at the parking lot around 6:30. Plenty of time to hike up and set the composition up and wait for the light. From the northern end of the parking lot of Lake Skannatati there is a set of stairs that lead into the woods. I seem to remember a well marked path heading up the hill to the left but it wasn’t marked or I may have missed it. It was a little dark in the woods but I did notice some plastic fencing strewn bout where the path was. At this point I should have suspected something. Instead, I followed the red trail up and around and found a side path to take me further up the hill and closer to the outcrop. When I finally arrived, there was a fence surrounding the area with a sign. It was a Harriman State Park reclamation project. Really? I drove an hour and a half, hike up the hill and then this. The sun was setting quickly and I needed another course of action, another location to shoot. I didn’t drive all this way not to do some photography. Knowing your location is very valuable under any circumstance but really came in handy here. Hustling back down to my car I headed over to Little Long Pond. The drive from lake Skannatati to Little Long Pond isn’t far but Harriman doesn’t make it easy because they blocked all the small parking spots in and around the pond. It was so much easier years ago to park near the pond. The light was dimming as it headed behind the mountains and I’m hustling down the road from a parking lot near by. I quickly tried a few different compositions along the waterfront. Nothing was working. Looking around for a foreground object usually sets the tone for me. I settled on this spot with the colorful rock to establish a near far composition. I used a 2 stop neutral grad filter to help balance the light between the background and the foreground. The sunset wasn’t as spectacular as I hoped but it was very pretty on this hot night.